TEDFUN-Granada 5th of JUne 2015. By INSERTEC; Enrique Uriarte & Victor Mendoza. 28 partners founders, attended by 14 companies. 16 employees, attended by 9 companies. President, Aser Etxebarria (FAGOR) and Marcial alzaga (TEDFUN), made presentation overview about the market and situation of casting in Spain; after this our colleague Victor Mendoza gave a conference about New technology for the linning of holder & dosing furnaces. Among the partners founders, the forecast is to get an increase of +10.2% (Total 104.955 tons) production in 2015. Others, furniture, equipment, electronics, machine tool…. The 14th international conference organized by the European Ceramic Society, ECERS 2015, ECERS 2015, took place in Toledo (Spain), last week. The even was divided in eight different topics covering all the specialties involving traditional and technical ceramics. 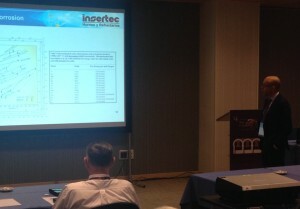 In spite of the weight of refractory business inside ceramic industry, refractory topic was attended for many people. INSERTEC , was invited to present a “Keynote” so our R&D Manager, Roberto Caballero, presented a review about refractory solutions for aluminium confinement, very welcome by the audience. Regarding the whole event, more than 800 scientists, technicians and professionals met in Toledo.